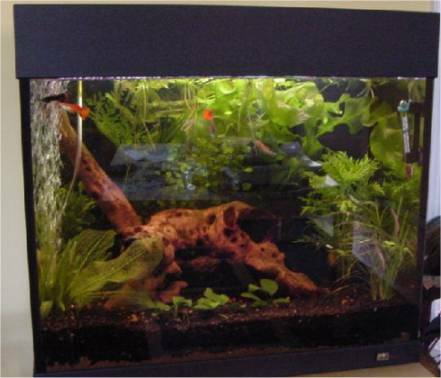 Tank Details: My tank is a Juwel aquarium and is 55x41x50 cm and is app 100 L.
The Fish: I have a pair of killies ( Aphyosemion Australe ) 4x Coolie loach,3x male guppy , 2x small clown loach , 1x small plec, 2x freshwater shrimps and another small pair of killies ( Nothobranchius rachovi ). 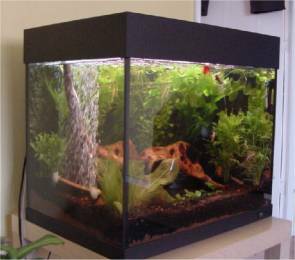 Comments: My tank has black fine substrate and is planted with real plants and bogwood. I perform a 15-20% water change every week. The tank is very active and the coolies never sleep, The Killies are great to watch especially when they eat live blood worm ! It has Juwel filter and air wall for the coolies to play in !